At the beginning of this month, ACsailingSF was delighted to host a special guest who traveled across the pond to visit our beautiful city, San Francisco. Yvonne Gordon is an award-winning features and travel writer whose work has been published in the Irish Times, The Irish Mail On Sunday, The Guardian, The Sunday Times, The National, and DK Eyewitness Travel Guides. Coming from a sailing background, Yvonne also writes about her experiences and various trips through her blog, Holidays On The Water. New to the San Francisco Bay Area, Yvonne knew little of what to expect. While she consistently sails on a bay in her hometown, the promise of steady wind conditions on the San Francisco Bay was a welcome and exciting change. The 84-foot America’s Cup-class yacht docked at PIER 39 with the crew in their professional gear was a sight to behold. Stepping aboard, Yvonne was pleased to find USA 76 to be “a real racing boat..designed for speed and performance”, which added to her enthusiasm for the trip. Throughout the two-and-a-half hour experience, Yvonne took turns at the helm, guiding USA 76 and her crew both on the upwind and downwind legs of the adventure. She even took command during a tack (direction change) underneath the Golden Gate Bridge! Thanks for joining us, Yvonne! Come back for another sail soon! 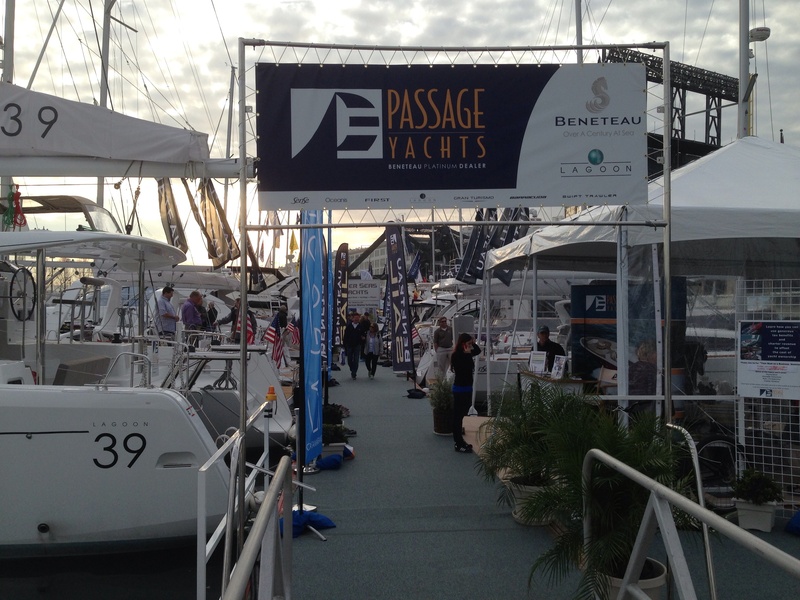 Last weekend San Francisco held it’s inaugural Boat Show at Pier 48 and McCovey Cove. The boat show spanning 4 days, we hope if nothing else, served as an inspiration. Boaters and newbies alike wandered the show with one thing in common – the desire, fantasy or reality of what the world of yachting can provide. Everybody’s own means as to how that manifests itself is unique. For us, we see sail racing as a platform unlike any other. It brings people together to perfect communication, teamwork and what it means to achieve a goal using a sophisticated piece of equipment in tune with natural elements. 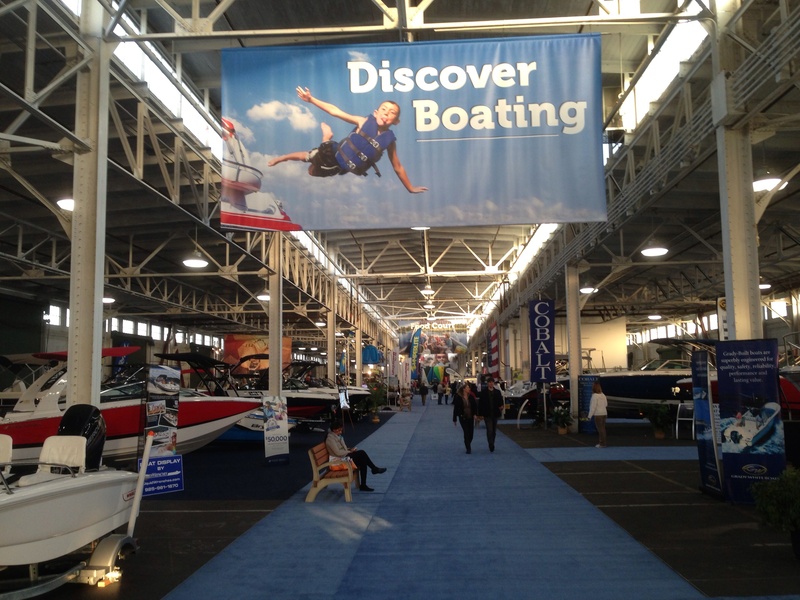 So those who went to simply discover boating, or to spread their passion for it, the reverberations of the show are sure to have inspired the San Francisco yachting community. View our most current reviews or write a review of your own on Tripadvisor. A special thank you goes out to all who have taken a moment to give us such great feedback. This is proof that the passion we have for sailing USA 76 really does permeate during the ACsailingSF experience. San Francisco a vibrant city with a rich cultural inheritance inclusive of famous historical landmarks and attractions including the picturesque Golden Gate Bridge, the island of Alcatraz, Chinatown, and the transportation staple of the city the famous San Francisco Cable Cars. It is no wonder San Francisco ranks as #35 worldwide as one of the most visited cities and a top tourist destination. There are so many fun things to do in San Francisco you could spend the entire week there and not be able to take them all in. There are the landmarks as mentioned above plus the third most visited tourist attraction in the U.S. Pier 39 a premier getaway with breathtaking views and unparalleled entertainment, shopping and dining options on two levels plus the infamous sea lions. Sailing in San Francisco is an exciting event as San Francisco prepares for the 34th annual America’s Cup ACSailingSF located at Pier 39 offers adrenaline, heart pumping rides on the 85 foot, 20 passenger USA 76, Challenger for the 2003 Americas Cup. Sailing was never more exciting and adventurous as it is aboard the Challenger with members of the Oracle racing team at the helm. Whale watching is an incredible experience in San Francisco, these magnificent creatures of the sea migrate annually off the San Francisco coastline. Catch them in their natural habitat, blue and humpback whales migrate June thru November and gray, sperm and killer whales migrate December thru May. Whale watching is a year round event surrounded by the natural beauty of the San Francisco Bay with its spectacular views of the city itself. Catch whale watching from Pier 39 at San Francisco Whale Tours San Francisco is known for its fine cuisine more than a dozen restaurants are located at Pier 39 plus a wide variety of stores are available. The famous Fisherman’s Wharf is also located next to pier 39. It is no wonder with the multitude of things to do, and places to eat that Pier 39 is so popular. There are many other attractions to visit including the zoo, museums, Golden Gate Park, Union Square, Historical Haight Ashbury District, the list goes on. San Francisco is a premier vacation and weekend getaway hot spot you wouldn’t want to miss. Hi Brad – Ben and I truly enjoyed getting out on the water with you on Sunday, and want to commend you and your people for giving us an experience we won’t soonforget, despite the churning conditions further up the bay. Driving the boat was the highlight of Ben’s weekend in the Bay Area. We are back in RI, where the weather has cooled down to what we would expect for springtime in New England – though the taste Ben received on Sunday, has him clamoring to get out on our boat after work today. Thanks again for a great afternoon on the bay. We had a full day’s worth of America’s Cup sailing with AC Sailing SF and every one of our guests had the time of their lives. “The highlight of my year” and “a once-in-a-lifetime opportunity” and “fabulous crew” were some of the feedback we received. Brad and his crew are professional and responsive and thought of all the details to make it a truly special event. We look forward to using AC Sailing SF again for future events. My husband and I sailed on Father’s Day aboard USA76 and we really, really loved it! What an amazing thrill it was! We enjoyed the boat, the crew, the experience and a beautiful day. Now, we have a family wedding coming up and we’d like to inquire about sailing again on Sunday, July 31st with my husband’s brother, sister-in-law and sister, and perhaps his sister’s husband, all of whom are extremely experienced sailors and racers and who will be in town for the wedding. Do you have openings on USA76 for that day? We would be a party of either four or five. We live in Point Richmond, so we could actually board USA76 at her mooring, if that’s more convenient. Looking forward to hearing from you regarding availability and prices. My apologies for not Emailing you before now about the great time our group had on USA 76 back on August 16! Absolutely perfect weather certainly helped (NO FOG at 10AM, a fresh-but-not-overwhelming breeze, nice temperature), but it really was the CAPTAIN and CREW that made this experience very special. I’m finishing up the September issue of our IYC Mainsheet newsletter, and USA76 is prominently featured. Give me about an hour (4PM or so) and you’ll find it available at http://iyc.org/mainsheet.html . Those folks took the word back to their homes in LA, Texas and Chicago, and have also spread the word and photos around the international sailing community in Second Life. I sincerely hope some of those sailors will make the trip here and try it for themselves.